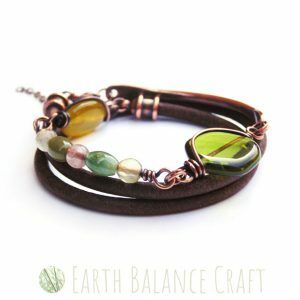 This hand-made copper bracelet features a beautiful green verdigris curved copper bar, a wire wrapped jasper coin stone and a hammered/textured curved copper bar, with a little gemstone droplet by the clasp. The design is inspired by river spirits, those who are guardians of the water in ancient folklore. The style is for lovers of Bohemian jewellery, who wear an eclectic mix of earthy textures and watery tones. 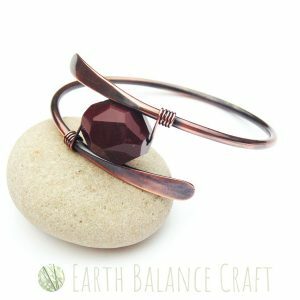 A rustic copper wire work bracelet with fluorite and labradorite beads. Inspired by the watery colours of the ocean, my love of the sea forever endures. This bracelet features muted hues of the sea with blues and greens that catch the light. A unique beaded bracelet design for women who wear a natural oceanic style of jewellery.